Successfully Added HK Warehouse CHUWI 14.1 Inch LapBook Notebook - Windows 10 Home, Intel Apollo Lake, 4GB DDR3L RAM, FHD 14.1 Inch, 9000mAh to your Shopping Cart. 9000mAh Durable battery life is perfect to deliver a long user time between charges. China's first laptop featuring an Intel Apollo Lake CPU is this new Lapbook Notebook from Chuwi. The new Atom Lake SoC is a 10-watt quad-core processor bringing 1.1GHz speeds and with a boost speed of 2.2GHz. What is more, this laptop PC is rocking Intel's 500-series integrated graphics and when running alongside the 4GB of DDR3 RAM in you get a seriously strong performance. Chuwi did a great job on the design of this laptop, it comes in a pure white plastic body but none the less feels fairly solid and the finish is of a high quality. Like the 15.1 inch model, this 14.1-inch Lapbook is very which not only adds to the aesthetic appeal but also makes it convenient for travel. When the laptop is opened you are greeted with a 14.1-inch screen, full qwerty keyboard and trackpad which both respond exceptionally well. The large IPS display brings FHD 1920x1080 resolutions and offers a bright and vivid viewing. With its 178 degree viewing angle and 16:9 aspect ratio this screen will deliver if you like to watch movies and enjoy gaming, it is also large enough to accommodate most work tasks comfortably. A fully licensed version of Windows 10 home pre-installed and has both English and Chinese languages available however it's easy to download and add additional languages should you need. With it's Edge browser and Microsoft's Cortana assistant, you can enjoy a rich user experience. When it comes to connectivity The Chuwei 14.1 Lapbook has a strong wi-fi connection with 802.11 a/b/g/n/ac, there are also plenty of ports including USB2.0, USB 3.0, Micro HDMI, 3.5 mm headphone jack and micro SD card slot. A 9000mAh battery delivers plenty of usage times between charges. 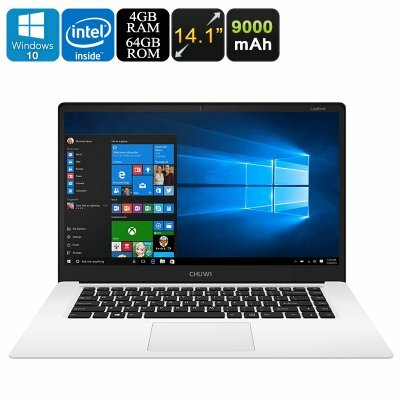 The Chuwi 14.1 inch Windows 10 Lapbook comes with 12 months warranty, brought to you by the leader in electronic devices as well as wholesale Laptops and tablet PCs..